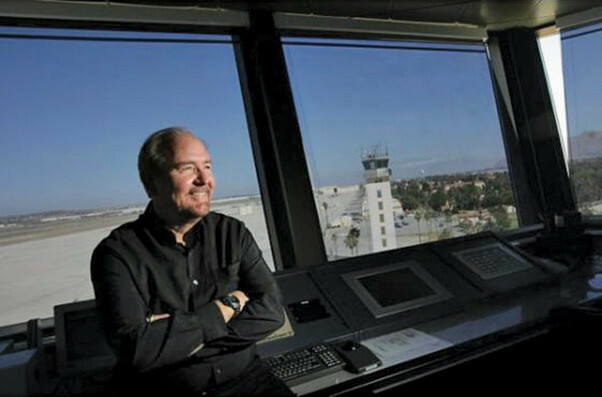 Christopher Lee Davis, July 26, 1955 – March 12, 2015 Airfield Operations Manager, Chris Davis, enjoys the view inside the new air traffic control tower at March Air Reserve Base, Calif., on June 16, 2014. Davis was part of the 12-year-long process to get a new tower at March Field, and said they got almost everything they asked for, even though it was tough. The old tower, which was demolished two month later, can be seen in the background. Memorial services for Christopher Davis are scheduled for Wednesday, April 1, 2015 at the Cultural Resource Center on base. The building number is 467 and the address is 870 Baucom Ave., March ARB, Calif. 92518. Services are 12 – 12:45 p.m. followed by a funeral at the Riverside National Cemetery, Staging Area 3 from 1:30 – 2 p.m.
Davis was the March airfield operations manager and had worked on base for the past 19 years. He will be missed. Please join us in celebrating and honoring his life. In lieu of flowers, the family asks you to make a donation to the Wounded Warrior Project at www.woundedwarriorproject.org on Chris’s behalf. For additional information, please contact James Smith at 909-896-1990 or Richard Perron at 951-805-1644.